Congratulations to our Under 13 team on reaching the Metropolitan League Final. Our first years have made an immediate impact this year competing with other first year teams all over the county. They are unbeaten so far and have beaten every opposition so far to reach this stage. A talented group of players with fantastic team spirit throughout has made all the difference. This is a great achievement in it’s own right, lets hope they can go all the way! The league started off with 2 group games. The first was a tough away draw against St.Aidans of Tallaght. The lads put in a huge 2nd half performance that day after being up against it for most of the first. We ended up with a 4-0 victory. Once the opener was scored they grew in confidence and went on to play some lovely football. Dylan Travers scored a brace of quality finishes, with the other goals coming from the head of Ore Lawal and the boot of Stephen Dempsey. Ismael Gba was outstanding between the posts to keep St.Aidans scoreless. The 2nd group game was another resounding victory and clean sheet against Adamstown CC at home. Riversdale ran out 5-0 victors. Adam Dempsey scored with a great finish to the roof of the net to open the scoring. Dylan Travers was on the scoresheet twice again and terrorised the opposing defence throughout. Adam Fox scored the 4th and Medhab Muhammad topped a great performance in the heart of the defence with a header from a corner. The Quarter Final was against Palmerstown CC in Corduff Park. Riversdale put in there best performance of the campaign to win 3-0 against a very good side. Ismael Diallo was like a man possessed driving up and down the right wing at every opportunity from right back. He topped a fine performance with 2 goals. Adam Fox put in a real captains performance from the centre of the park, working tirelessly helping defence and attack. He scored a cracking long range effort and his 2nd of the tournament. 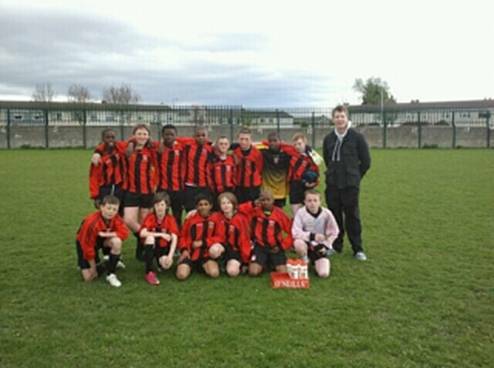 The semi-final was played against a very strong, well organised Finglas side, Patrician CC. For the first time Riversdale conceded a goal and went behind after a deflected shot crept in. 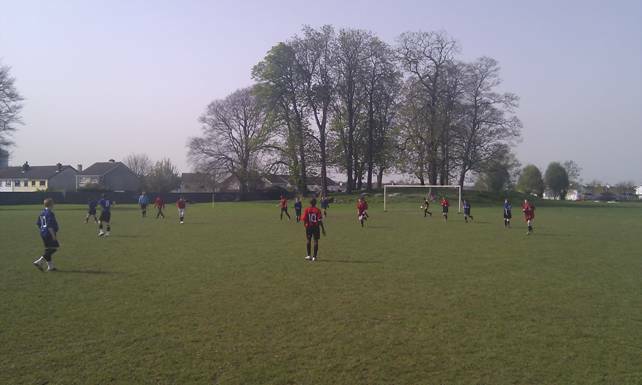 The lads battled hard to get back in the game and played some lovely football but couldn’t find an equaliser. The leveller came just after half time, Adam Fox drilling a shot in low and hard in to the far corner. It was nip and tuck for most of the 2nd half and Patrician CC almost won it at the death only for some superb and brave goal keeping by Ismael Gba to keep them out. The game went to extra time and Riversdale seemed to grow stronger. Super sub Teboho Mujaki scored the deciding goal with a superb finish after some great work down the wing by Ismael Diallo. Only one game stands in the way of Riversdale lifting the cup now and based on there performances so far they have every chance! It’s been a great year for this group of lads, making a massive impact in there first year in the school. They work very well as a team and have done Riversdale proud. Ismael Gba has been a rock in goal throughout! He has got great protection from the defensive back line of Mehdab Muhammad, Leroy Bankole, Ryan McCarthy, Ismael Diallo and Craig Hannon who has always done a job when asked of. The midfield have created a great platform for the team to build on with hard work and some great creativity. Ryan Tiebel, Stephen Dempsey, Gavin Killian and Adam Fox who has captained the team magnificently, have all dug deep when needed and created plenty of opportunities for the front men. The attacking trio Ore Lawal, Adam Dempsey and Dylan Travers have all registered goals during the tournament and always look dangerous in attack. Dylan Travers will be looking to add to his tally of 4 goals when the final comes around. Everyone has played their part, Kehinde Obudare made an immediate impact when coming on against Adamstown and almost got on the scoresheet. Super sub Teboho Mujaki who scroed the winner in the semi has put in some fine performances when coming in. Best of luck in the Final.